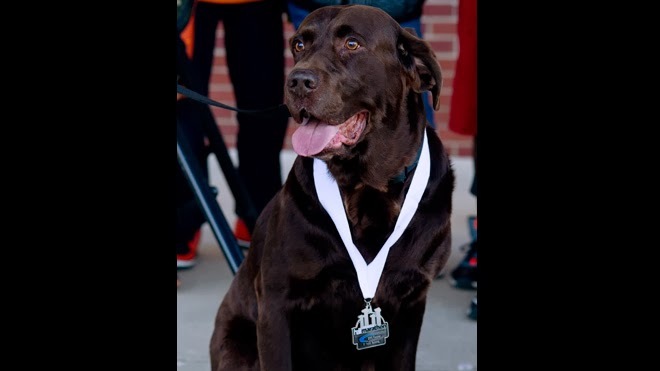 The Internet star of this week is Boogie, an 8-years-old chocolate Labrador, who unleashed his athlete spirit and won a medal after finishing YMCA’s Half Marathon in Evansville, Indiana, this past Saturday. This was not the first adventure of Boogie, who slipped out of his leash Friday night by the forth time in the last weeks and made his appearance at the race, where he ran alongside Kim Arney. Right after crossing the finish line, and got his medal, he was taken to Animal Control who sheltered him until he was reunited with his owner. The four legged runner, completed the 13.1 miles of the race in 2 hours, 15 minutes without any assistance, pacing him as better than more than half of the human participants obtaining a medal for his achievement. Boogie’s was resting at Evansville Animal Care and Control Shelter when he was reunited with his owner Jerry Butts, who was looking for him at city refuges. Boogie’s brave nature gave him a lot of press in addition to a medal as a reward for his achievement, high chances to be neutered, and an appointment to be microchipped. Maybe the race organizers and Boggie owner should consider his natural talent and officially register him to the next year competition. We are certain he would do good in it, we are already cheering for him.